Peter Asher and Gordon Waller were often called "the Everly Brothers of the British Invasion". Their overall sound and vocal work influenced groups like the Byrds; they harmonized in ear pleasing intervals, strummed acoustic guitars in tandem, and recorded an impressively consistent string of hit songs. Blending folk, blues and rock 'n' roll with their own pop-flavored English sensibility, they managed both commercial success and musical integrity; their versions of "All My Trials" and "500 Miles" were the performances that turned heads and led to a recording contract. The result was ten U.S. Top 40 hits between 1964-1967, including eight in the Top 20. "World Without Love", their debut single, peaked at Number 1 in May of 1964. That smash hit made Peter and Gordon the first British act to hit #1 in the wake of the Beatles' success at the dawn of that year-the year that brought a cultural watershed forever known as the British Invasion. Waller met Asher at Westminster School in London. They appeared to be the only two people at school at the time who played guitar and sang, and soon became friends and tried singing together. Gordon started as a rock 'n roller, above all a big fan of Elvis; Peter was originally a big fan of jazz and American folk music. They learned from one another, found common ground in The Everly Brothers and Buddy Holly, and a duo was born. They first started singing together for their own entertainment, alone or at parties and eventually tried a lunchtime gig for a little money and free food in a local pub. From there, they got a regular booking at The Pickwick Club, a fashionable supper club in London where a lot of show business people went. After they had been singing there for some months, Norman Newell, an A man for EMI Records called them over to his table one night, asking "Have you boys ever made a record? Here's my card, I work for EMI, come and make a demo." They did, he liked it and signed them to a contract. At that time, Peter and Gordon had recently become good friends with Paul McCartney. Paul was going out with Peter's sister Jane and he and Peter ended up sharing the top floor of the Asher family home in London. As their first recording session drew near and Peter and Gordon were looking for songs, they remembered a song Paul had played them, which he had written but never used, "World Without Love". They asked Paul whether he would write a bridge for it and allow them to include it on their first recording session and he did so. It was subsequently chosen by EMI (and by Capitol, their US affiliate) as the first single and went to number one on both sides of the Atlantic (and around the world) in 1964. The duo went on to score hits with the Lennon and McCartney songs "Nobody I Know" and "I Don't Want to See You Again", along with "Woman" (written by McCartney under a pseudonym). Suddenly Peter and Gordon were among the most recognizable faces of the British Invasion. Peter and Gordon also turned out to be astute song finders outside the Lennon-McCartney sphere. "I Go to Pieces" was acquired while on tour in Australia with Del Shannon and The Searchers. Del was playing it for the Searchers in their dressing room, they didn't want it, and Peter and Gordon did. The two also had success with Buddy Holly's "True Love Ways", and Phil Spector's "To Know You Is To Love You", all of which charted well in the U.S., making the Top 40. They also found success in 1966 and 67 with music-hall novelties such as "Lady Godiva" and "Knight in Rusty Armour," and parent-pleasing pop like "Sunday for Tea". They toured extensively all over the world and performed on most the major TV shows on both sides of the Atlantic, from Thank Your Lucky Stars and Top of the Pops in the UK to Ed Sullivan, Shindig and Hullabaloo in the US. Following a four-year, ten song hit spree and many successful concerts Peter and Gordon amicably went their separate ways in 1968. Peter Asher became an independent producer and a director for the Beatles' Apple Records then later moved to Los Angeles with his client James Taylor and became a manager as well. As a record producer, he helped usher in the mellow "California rock" sound made famous by many artists he worked with, including Linda Ronstadt, James Taylor and 10,000 Maniacs and went on to win several Grammys and numerous other accolades. Gordon Waller carried on alone. In 1970 he came to America to record a solo album in New York titled ....and Gordon. In l971, Gordon was approached by Tim Rice to play the part of Pharaoh in the musical Joseph and His Amazing Technicolor Dreamcoat at the Edinburgh Festival. The show was a smashing success and Gordon has pursued a singing and writing career ever since. Along with his musical career he pursues many other varied interests from landscape gardening to trading model trains. 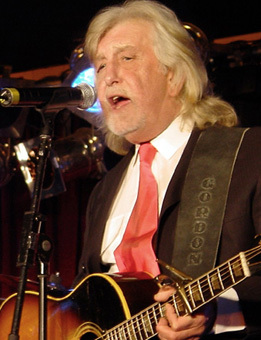 In August, 2005, Peter and Gordon played a benefit concert for Mike Smith of The Dave Clark Five, who was seriously injured in a fall at his home in 2003. It was the first time the pair had performed together in 37 years and both fans and press reacted with great enthusiasm. They continue to tour today, including a number of acclaimed performances in 2006 and 2007 at Casino Rama in Ontario, Humphrey’s in San Diego, The Cannery in Las Vegas and Walt Disney World’s “Flower Power”. Peter and Gordon are currently featured on the PBS Special My Music: The British Beat.